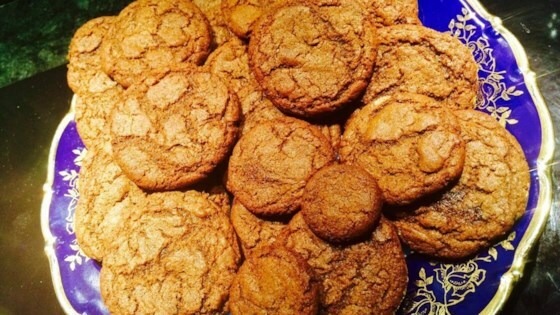 "This recipe for hard ginger nut biscuits is possibly one of the oldest ones I have in my possession. My English grandma used it many years ago. The cookies are fabulous for dunking. [Recipe originally submitted to Allrecipes.co.uk]"
Preheat the oven to 180 degrees F (82 degrees C). Grease 2 baking sheets or line with parchment paper. Warm golden syrup in a saucepan over low heat, about 2 minutes. Allow to cool slightly in the saucepan. Combine flour, sugar, and ginger in a bowl. Rub in margarine. Mix in baking soda. Stir flour mixture into the golden syrup in the saucepan until dough is well combined. Take a small, walnut-sized piece of dough and roll it into a ball; continue with remaining dough. Space biscuits evenly apart on the prepared baking sheets. Bake in the preheated oven until biscuits are slightly cracked on the surface, 10 to 15 minutes. Transfer to a wire rack to cool.